Eight of the paintings that were exhibited in my show Vast at Galatea Fine Art. I gaze at the ocean, a mysterious and constantly changing reflection of its surroundings. Light and motion create shifting patterns that imply a path to somewhere. My mind travels out to sea, lost in a water reverie. Wild and tranquil, threatening and beautiful, the ocean is both intimately personal and infinitely universal. Oh, to have that feeling of serenity from being on, in, or just near water. I hear the waves as I paint. My interest in seascapes reflects the 19th century romantic concept of finding solace in the beauty of nature, and current research that shows being around water provides a long list of benefits for our mind and body. The contemporary issue of human responsibility for the destruction of our oceans contrasts with our need for water. Sadly, we are killing the very element that gives us life. 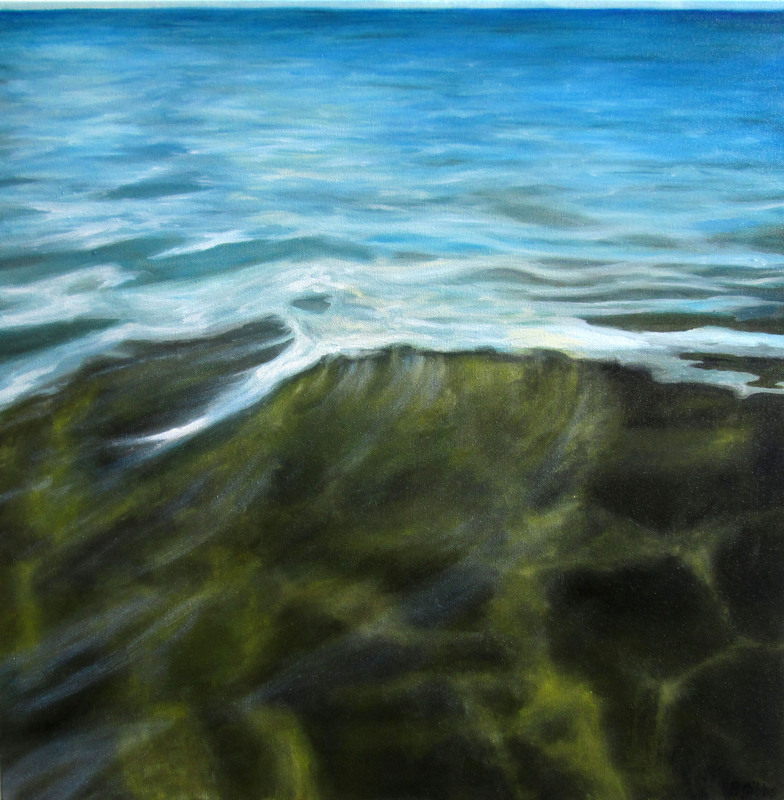 On first glance the work may appear photographic, yet on closer look my oil paintings may reveal brushstrokes, unexpected color, and abstract detail of the water. These Ocean Field paintings have no horizon or reference to scale and lack human presence. The compositions could easily extend beyond the physical edge of the painting. An emotional narrative ̶ the vast ocean. Four of my oil paintings will be in the group exhibit “Everything that Grows”, at Paula Estey Gallery in Newburyport, MA. Opening reception, April 20, 6-8:30pm. Two of my oil paintings will be in the group exhibit Fresh Forward, at Galatea Fine Art, Boston. Come to SoWA – Boston’s leading arts destination – for First Fridays – over thirty gallery openings on one night on the same block! Galatea Fine Art is pleased to announce the opening of “Fragmentary Blue”, a solo exhibit of oil paintings by Becky Kisabeth Gibbs. This exhibit of new paintings will open with a reception on Friday, November 4, from 6-8pm, and continue through November 27, 2016. 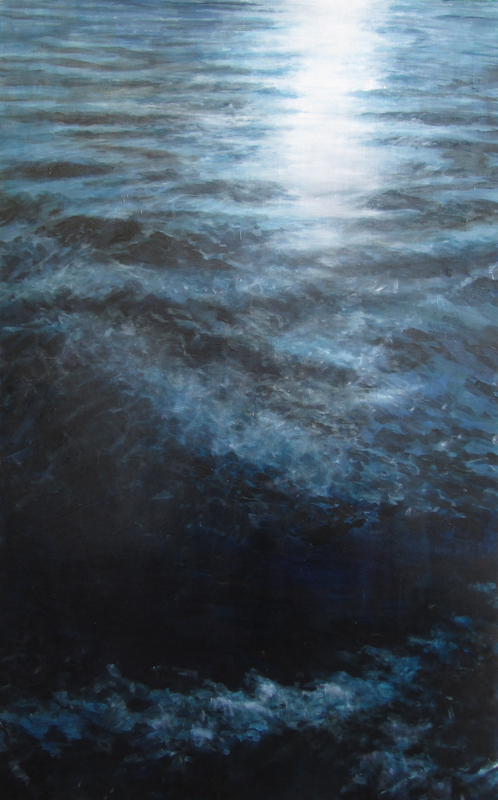 Galatea Fine Art is pleased to announce the opening of “Ocean’s Edge”, a solo exhibit of oil paintings by Becky Kisabeth Gibbs. This exhibit of new paintings will open with a reception on Friday, September 5, from 6-8pm, and continue through September 28, 2014. Categories: Art, Uncategorized | Permalink.